With the rush of the new school year underway, and trying to get used to different schedules, use this recipe to fit a home-cooked dinner into everyone's new routines without compromising health, taste, or time. 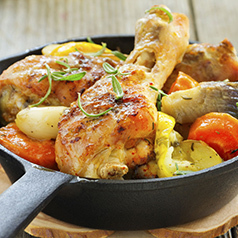 What could be better than only having one pan to wash after a home-cooked meal? Double the recipe to have leftovers later in the week or use for lunches the following day. In large baking or roasting pan, combine the first eight ingredients and toss to coat. Roast veggies for 25 minutes, stirring once. Salt and pepper chicken and add to pan. Cook for an additional 15 minutes or until juice from chicken runs clear. Add spinach to chicken and veggies and cook an additional 5 minutes. Be sure to check out our other recipes for more delicious and healthy meals.